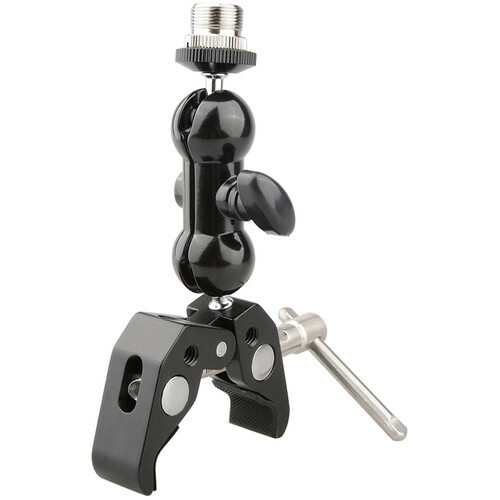 Attach a microphone or other accessory to a rod system with the Crab Clamp with 360° Ball Head for Microphone from CAMVATE. Made from CNC-machined aluminum, the clamp provides several 1/4"-20 and 3/8"-16 threaded mounting holes, and it secures to any rod sized 15-54mm via a silver T-handle screw with sliding bar. The clamp features rubber padding to ensure a snug and secure fit without marring your equipment. Affix your microphone or accessory to the 5/8"-27 microphone screw on the ball mount which rotates 360° for fine adjustment. You can also remove the microphone screw and use the 1/4"-20 screw on the ball mount for a variety of attachments. Box Dimensions (LxWxH) 6.65 x 4.25 x 1.35"
Crab Clamp with 360° Ball Head for Microphone is rated 3.0 out of 5 by 1. Rated 3 out of 5 by Scott from Wish Clamp Was Bigger I bought this for recording bands that allow audio recording, expecting to clamp to balcony rails, etc. The jaws arent quite big enough to clamp to standard rails 3 in diameter. It held quite well to a mic stand, however, supporting a stereo bar, two shotgun mics and cables. Not sorry I bought it, but Ill need another, larger clamp for railing-clamping.